Lessons at Mrs. Browning’s School for Girls, meant to prepare her for social advancement as a secretary, fail to inspire her. Having assisted her midwife mother at many difficult births among the poor, Prudence wants to find a job doing something important, preferably something to help fight the death and disease she sees all around her. She can hardly believe her luck when she lands a job as assistant to New York State’s head epidemiologist, George Soper. Typhoid fever can occur in clusters even among the well-to-do, and Prudence’s careful record-keeping and analysis help Mr. Soper pinpoint the cause of an outbreak on Long Island. There, Prudence and her chief encounter Mary Mallon, the furiously defensive Irish cook whom history knows as Typhoid Mary. 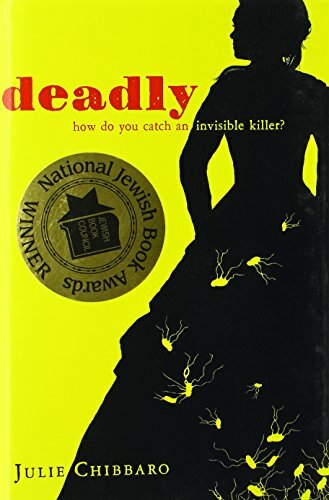 Prudence suffers qualms of conscience over the methods the health department uses to track down and detain the immigrant cook, but at the same time she blossoms under the possibility of finding a new identity for herself as a woman scientist. Ms. Chibbaro lets Prudence tell her story through short journal entries that show her growing sense of commitment to science, her struggles against the disapproval of the women around her, and her stirrings of romantic feelings. Scattered throughout the journal are careful biological drawings that we assume are Prudence’s own. Prudence’s language is balanced and formal, as far as possible from the chatty language of modern teenage chick-lit. Along with the language, details of transportation and street life give a strong sense of place and time to the story. The state of a young girl’s scientific knowledge is also accurately portrayed: at one point, Prudence muses at the strange idea that it takes “many hundreds” of cells to make a person. Both Mr. Soper and Dr. Baker are historical characters, and the novel’s plot keeps reasonably close to the known history of Typhoid Mary. The book’s title and flap copy may lead young readers to expect a mystery, or at least a story where Prudence plays a more central role than she does in uncovering the truth. Readers looking for the conventional twists and turns of mystery will be disappointed; the solution appears without much suspense in the first half of the book. Others expecting a conventional romance will also be disappointed by Prudence’s choice of love object and her eventual decision to move beyond it. This book isn’t a romance or a mystery; it’s a voyage of self-discovery. Any reader who has occasionally felt isolated by her commitment to learning or by her aspirations to more than social success will find herself rooting for a sister spirit in Prudence. This book will be especially welcome to girls with an interest in science, medicine, history, or just in reading about a strong, honest female protagonist.